Pink Castle Blog: Feature Friday, um Saturday! 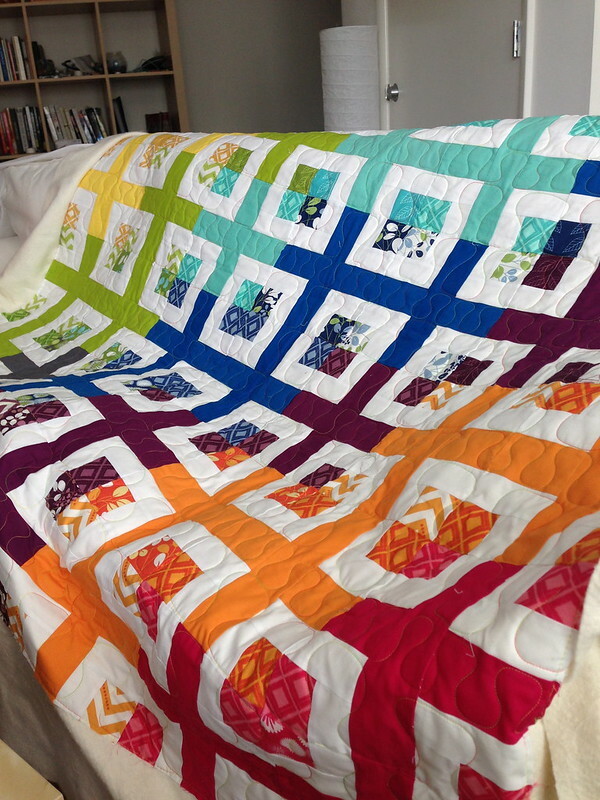 I've been really wowed by this scrappy plus quilt by Meli from the blog Munchkin Quilts, which was coincidentally inspired by a quilt I'm working on. (cough, full disclosure - though I got the pattern from Brenda - so it is just a chain of outward radiating inspiration). However she did not use the pattern as Brenda wrote it, instead she used 5" charm squares for the center blocks, and did white for the sashing, and matched it to coordinating solids from her stash. The charm pack she used was Simply Color by V and Co for Moda. What a great use for a charm pack! The colors are just amazing, and I love how they ripple into each other. 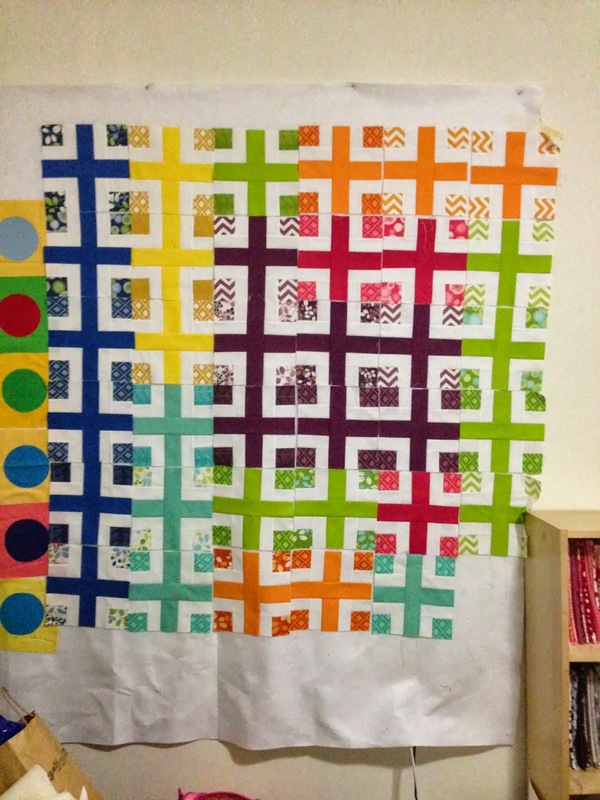 She rented time on a longarm machine to quilt it herself. 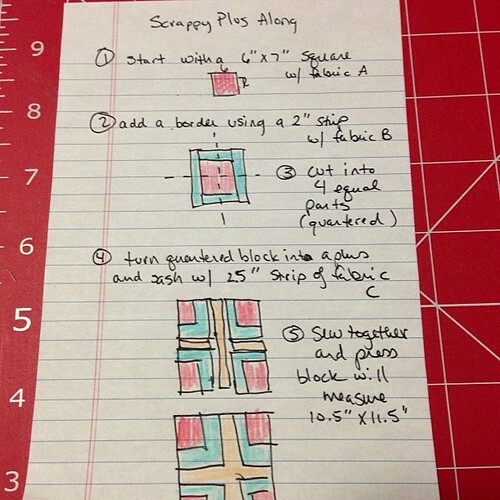 Here are the blocks laid out as they were being made- she organized them differently in the final top. Meli works as a nurse at a military hospital, and she made this quilt for a patient of hers, a female army parachutist who was involved in a major accident while training. She wrote on her blog that she made the quilt to fill a need because "since it's a military hospital most of the donations we get are geared towards men.... 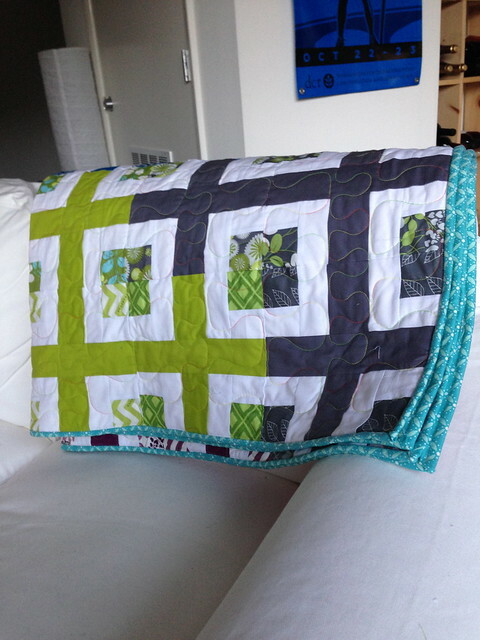 I know [this quilt] will be loved by both her and her family." And that is the best thing any of us can hope for with our quilts really. I initially reached out to Meli just because I loved how this great this quilt looked, but the story behind it is even more amazing. There is so much going on in the world, and in our lives, in this season of hope and giving, this is a great reminder for us to look past the beauty of things, and see also the needs that aren't being met, and how we, as sewists, as makers of things, can reach out and meet them. By the by, Vanessa Christenson of V. and Co will be teaching at Camp Stitchalot next September, along with fellow fabric designer Bari J.